I haven't been this excited about bread in a long time. Maybe ever. Sure, a crusty, rustic loaf—the kind that leaves a trail of shattered crumbs all over my clothes and the kitchen counter—is great, but it's not often that I crave it. 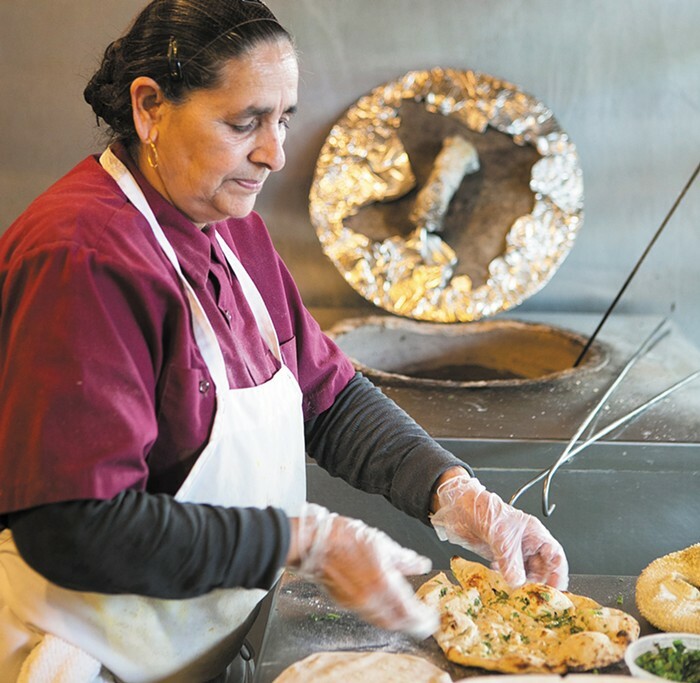 For the last month, though, I've found myself repeatedly pointing my car toward a warehouse behind the Walmart in Renton to eat the warm, fresh, cooked-to-order breads at Spice King, a Punjabi restaurant tucked inside the international grocery DK Market. Spice King's stuffed parathas ($4.99) arrive at your table straight from the griddle they are cooked on, hot and steamy, soft and floppy. They look like giant savory pancakes, each one about a foot in diameter. Their edges hang off the serving plates enticingly. The parathas are made from an unleavened whole-wheat dough—dusty brown in color, laced with a hint of grittiness and sweetness—that are rolled out into thin, wide circles before being stuffed with spiced fillings such as aloo (potato), gobi (cauliflower), keema (ground lamb), mooli (grated radish), or the soft cheese called paneer. The mooli is especially tasty: moist, earthy, sweet, with a pleasant edge of bitterness. You can order your parathas (and every dish at Spice King) mild or spicy, on a scale of zero to five stars. It's well worth the risk of burning your fingertips (and the roof of your mouth) to immediately tear into a hot paratha, its swaths of dough dotted with gorgeous golden-brown bubbles. The bread rips apart easily into jagged-edged pieces, steam and bits of diced cilantro flying out. Dunk your paratha in some of the cooling yogurt-based raita that accompanies it, or add fuel to the fire by dipping into the fiery house-made fluorescent coral-colored hot sauce. Or do both and, while you're at it, be sure to try some of Spice King's verdant mint chutney—herbaceous, tangy, and subtly sweet. Paneer naan ($4.99) is an entirely different bread, but no less delicious. The naan, stuffed with crumbles of creamy, slightly tangy paneer and fresh cilantro, is made from a leavened white flour dough that's baked inside a clay oven called a tandoor. As it bakes, it transforms up into a light, airy bread. Bubbles puff up on its surface, and the heat from the tandoor brandishes them with a flavorful char. After cooking, it's brushed with a generous coating of clarified butter and arrives at the table glistening and lovely. Spice King's tandoor also produces a satisfying keema naan ($4.99), which is stuffed with spiced, finely minced lamb and sweet peas. Tandoors have long been used in the province of Punjab; they are, traditionally, wood-fired clay ovens that imbue the meats and breads cooked inside them with heavy dose of smoky, grilled flavor. (These days, tandoors can be portable, fueled by gas or electricity, and made of stainless steel.) According to Pushpesh Pant, author of the massive and comprehensive India: The Cookbook, Punjab has given the world "tandoori food, tandoor ovens, and, arguably, the Indian restaurant." When the British left India in 1947, the subcontinent was divided into two independent countries, Pakistan and India. Punjab—home to Hindus, Sikhs, and other religions and ethnicities—was also divided into two separate provinces, displacing huge numbers of people and scattering Punjabi refuges throughout India. "A string of Punjabi roadside restaurants called dhabas sprang up all over the larger cities and proliferated along every highway," writes Pant in India: The Cookbook. "They introduced the rest of India to the joys of tandoor cuisine and the pleasures of eating out. Dhabas started not as a business proposition, but as the refugee strategy for survival. The food is mostly cooked in a tandoor oven, the menu is limited, ingredients are fresh, and the food is simple." Today, Punjab produces more than half of the country's grains, including a large percentage of its wheat, which may explain why there's so much wonderful bread at Spice King. While you could easily make a meal out of its stuffed parathas and naans, don't miss its plain breads, which are perfect companions to the restaurant's other dishes (of which there are many), including tandoori-cooked chicken, lamb, and fish. Boti kebab ($12.99), cubes of charred, tandoori-cooked lamb, are served on a sizzling cast-iron plate with onions and bell peppers. They're tossed in an odd, though not entirely unpleasant, sweet-sour-spicy glaze that can be cut nicely with a generous squeeze of lime juice. The meat is deeply gamey and smoky, and it tastes great wrapped in a piece of plain, buttery naan that's been dragged across the hot plate to pick up sticky bits of flavor. A drizzle of mint chutney brightens each bite. Naan also acts as an efficient sponge for soaking up the complex gravy—rich with red chilies, ginger, cardamom, and other spices—in Punjabi bakra ($11.99). Tender pieces of musky goat swim in the dark, flavorful sauce, begging to be sucked clean off their little bones. Spice King offers a long list of vegetarian dishes made with lentils, chickpeas, and eggplant. Bhindi masala ($9.99) is a standout: Thin slices of okra, fried so they are dry, crispy, and without any trace of their viscous juices, are tossed in a thick gritty spice paste that's warm with cumin, bitter with fenugreek, and hot with chilies. Spread the okra on a piece of fresh roti—a thin whole-wheat bread baked in the tandoor—whose simplicity contrasts all of the dish's spices and crunch. Saucy dishes like saag paneer ($10.99), cubes of cheese nestled into a sea of pureed spinach and mustard greens—so dark and green it tastes like the forest—demand to be sopped up with Spice King's roti and naan. The sauce is so dense and velvety that it clings to your spoon, landing on your bread only after a strong flick of the wrist. Much of the action at Spice King comes from its location inside DK Market, a sprawling market selling Asian, Eastern European, and Middle Eastern ingredients. There are whole aisles of tinned fish, olive oils, dried legumes, and international cookies. Its shelves are stocked with seemingly every ingredient imaginable, from bitter melon to Washington-grown buckwheat, kefir-cultured farmers cheese to Iraqi flatbread. A diverse set of customers push their way through Spice King's front doors, inquiring about samosas, chutneys, and levels of heat. "Ma'am, three stars is still very spicy," a woman behind the counter recently told a customer hoping for a dish that was medium-spicy. "You see, Indian 'spicy' and American 'spicy' are very different."